After two years of bitter partisanship and personal attacks, President Donald Trump will call for unity and cross-party cooperation in Washington during Tuesday’s State of the Union address, a message likely to ring hollow with Democrats determined to block his push for a border wall. Another Democratic star, Stacey Abrams, will deliver the party’s response to Trump. Abrams narrowly lost her bid in November to become America’s first black female governor, and party leaders are aggressively recruiting her to run for US Senate from Georgia. 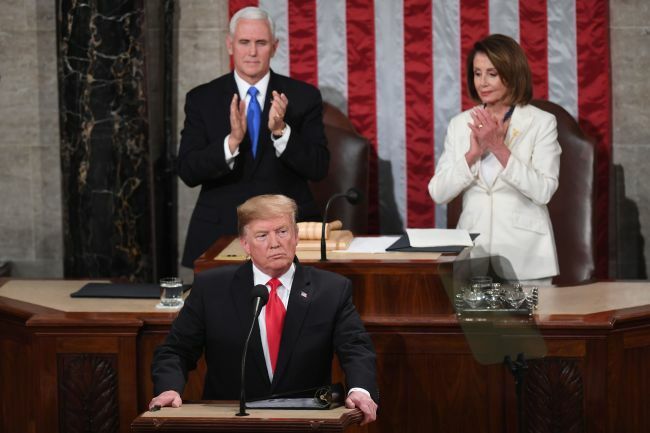 While Trump was still putting the final touches on the speech Tuesday afternoon, he was expected to use some of his televised address to showcase a growing economy. Despite the shutdown, the US economy added a robust 304,000 jobs in January, marking 100 straight months of job growth. That’s the longest such period on record. Trump and his top aides have also hinted that he is likely to use the address to announce a major milestone in the fight against the Islamic State group in Syria. Despite the objections of some advisers, Trump announced in December that he was withdrawing US forces in Syria. Trump is expected to detail other looming threats from abroad, including Iran and the tumult in Venezuela, where the US has called on embattled President Nicolas Maduro to step down. Trump may also preview plans to hold a second summit with North Korean leader Kim Jong Un.